WASHINGTON, DC, August 23, 2011 (ENS) – A 5.9 magnitude earthquake centered near the small town of Mineral, Virginia this afternoon was felt from Maine to North Carolina. The U.S. Geological Survey said the quake was centered just 84 miles from Washington, DC. The White House, the Capitol and other buildings in the nation’s capital were evacuated shortly after the quake struck at 1:51 pm. Thousands of people poured into the streets of downtown Washington. Terminal A at Washington Reagan National Airport was evacuated after a gas odor was detected, officials said. Amtrak trains came to a halt, and cell phone service was disrupted as calls overloaded the systems. President Barack Obama was vacationing with his family in Martha’s Vineyard during the earthquake. At 2:50 pm the President convened a conference call with agency heads, including Homeland Security Secretary Janet Napolitano, to receive information about the quake. Vice President Joe Biden is visiting Japan, today visiting cities devastated by the 9.0 earthquake tsunami in March that touched off one of the world’s worst nuclear disasters. 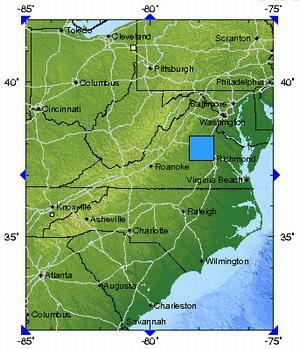 In Virginia, the quake forced the shutdown of two nuclear reactors at the North Anna power plant near Mineral operated by Dominion Resources, according to the Nuclear Regulatory Commission. The plant lost off-site power, but diesel generators are operating, said the NRC spokesman. 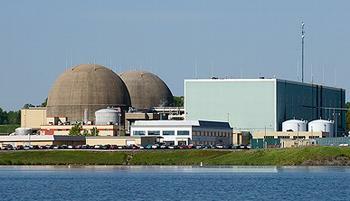 The other nuclear power plants on the East Coast were not affected and are operating normally. The Washington National Cathedral was damaged in the quake. Three spires broke off the central tower and fell to the ground, and the Cathedral is closed for the afternoon. Damage also occurred at the Ecuador Embassy, according to the D.C. Fire and EMS agency. Federal Emergency Management Agency spokesperson Rachel Racusen said the agency is monitoring the situation in coordination with partners in the National Capital Region and state partners. “Though there are no early reports of major damage or requests for assistance at this time, preliminary damage assessments are currently taking place in all affected states and we will continue to work closely with their emergency management officials,” she said. Traffic is now gridlocked in Washington, DC as workers try to return home. In Virginia near the epicenter some homes sustained damage; grocery and liquor stores lost stock that was knocked off shelves by the shaking. 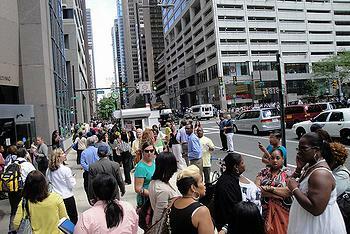 Tall buildings from Philadelphia to Wilmington, Delaware and Atlantic City, New Jersey were evacuated, including Philadelphia City Hall. In a news conference outside City Hall, Mayor Michael Nutter said no major problems were reported as a result of the earthquake. 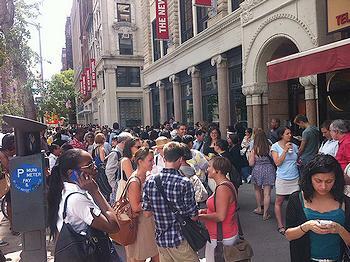 In downtown Manhattan, police ordered the evacuation of New York’s City’s Hall shortly before 2 pm, sending Mayor Michael Bloomberg and his staff out of the building, but they all quickly returned to work. “Like people up and down the East Coast, New Yorkers across the five boroughs felt the effect of this afternoon’s earthquake in Virginia,” said Mayor Bloomberg. Aftershocks are expected, warned the U.S. Geological Survey.